Maybe you’ve seen this meme floating around. There’s a couple versions of it. Well, I can answer that question. First, let’s start with it being a false and exaggerated representation. 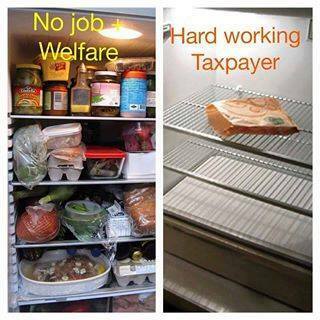 I didn’t think I had to state this but I strayed into the comments section (I know.Never a good idea) and found that people believed these to be actual “welfare” and “taxpayer” fridge photos. FYI to those people: Type in “full fridge” on The Googles. Go to images. Pick whatever picture you would like to falsely represent your point and go with that one. Now do the same for “empty fridge”. Look at you, using the Internets. You go,dude. So,there’s the first thing wrong with this picture. #2: No job+ welfare is not an accurate depiction of who receives assistance. Just over 40% of SNAP recipients live in a household where someone is earning money (like mine). The rest? Children,disabled, elderly, and people attending school or work training make up most of the remaining 60%. Most unemployed childless adults are limited to three months of benefits, unless they are working at least 20 hours per week or participating in a qualifying workfare or job training program. If someone receives cash assistance, it isn’t much. Often it isn’t even enough to cover their rent plus basic utilities. Basically, the welfare fridge can also be a working person’s fridge. If they aren’t working, there’s a reason. 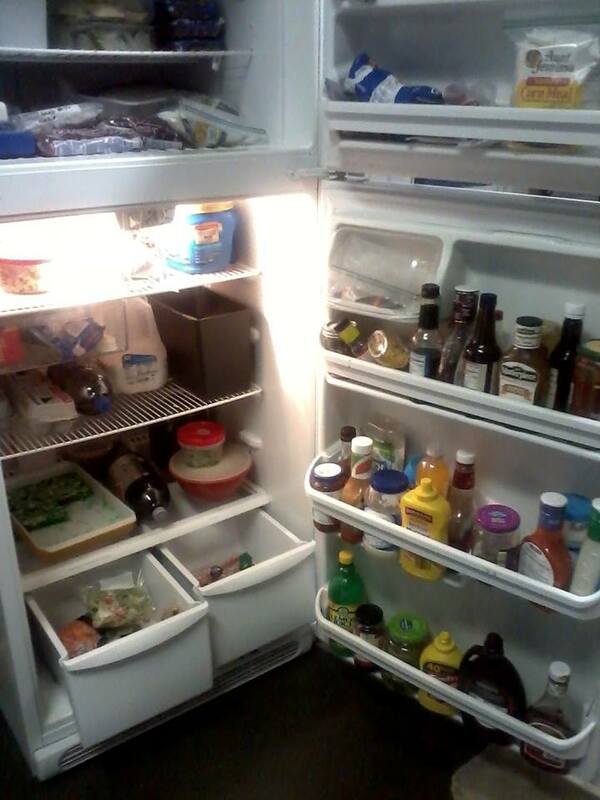 If that fridge on the left was actually a SNAP recipient’s fridge, that’s good. It means that SNAP works how it should. The point of the program is to put food in people’s refrigerators. It makes me wonder what the expectation is here. 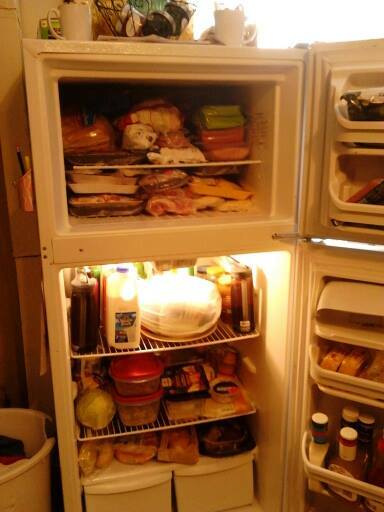 Should the person receiving assistance have nothing in their fridge at all? But SNAP most certainly does not always fill a fridge quite as well as your average food stamp hater might have you believe. Depending on regional cost of living, affordable food accessibility,access to transportation, ability…. so many things factor in to obstacles to putting food in the fridge when poor. Plus, Faux News will tell you that 99% of poor people have refrigerators like it’s proof of their ability to eat. They don’t mention that some of those poor people’s refrigerators aren’t working because there was no money to pay the electric bill. It’s important to note that there are also many people in the U.S. right now struggling with food insecurity who are NOT receiving SNAP. Some of them are eligible and unserved, often discouraged by their state’s process. Some of them just above the eligibility qualifications. This is especially a dangerous place to be. Instead of cutting SNAP, it should be expanded to cover the needs of those people. 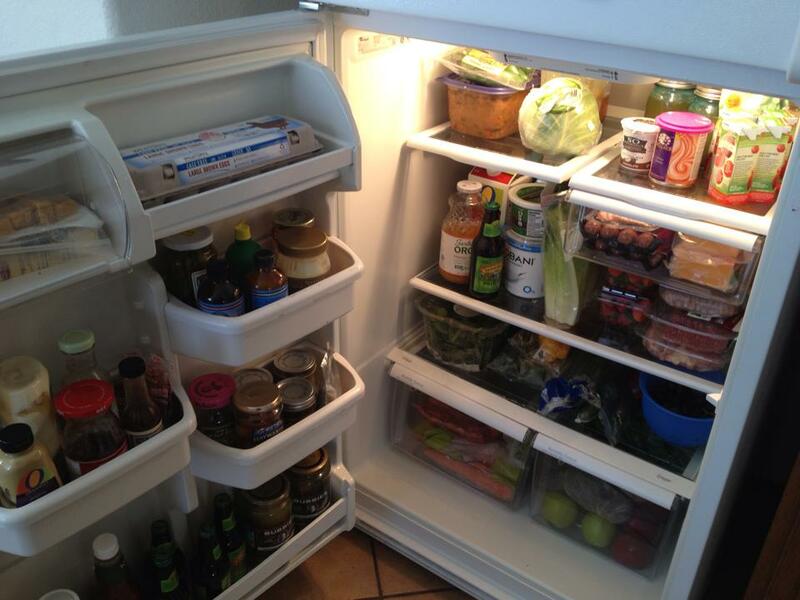 I asked some people to share what their refrigerators look like. Ideally, I would have shown you what my own fridge looks like from the start of my SNAP issue date (the 9th of every month) up to just before the 9th of the next month. Typically, my fridge is stuffed just after the 9th and as the month goes on ,it’s more like the picture on the right there . Not as empty because there’s always condiments,right? Right now, it’s before the 9th of the month and we’re in good shape on food, thanks to having extra money from our tax return. My own fridge right now is not a typical picture of what SNAP looks like for our family. We DO NOT receive SNAP (we make too much $$$ ,they say). After bills are paid we have about $350 a month for food, household items (like laundry soap, toilet paper, dish soap, bath stuff), gas for the car and any upkeep/emergency stuff. Nichole: “I’m single, physically disabled; son, 14; and son, 7. We receive $153 monthly in SNAP. The pics are a couple days after a grocery trip, which is generally done weekly.I don’t really shop sales, but just go to the local two stores for what we need because of the whole walking thing. And sometimes, usually once a month, have groceries delivered (SNAP doesn’t cover). 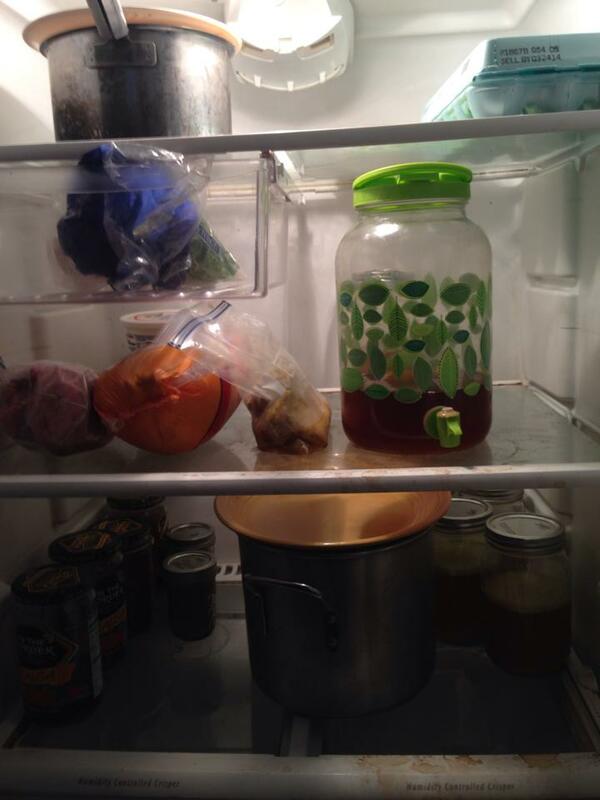 I can’t quite tell what that is in Hard Working Taxpayer’s fridge, but it look an awful lot like an empty TAKEOUT bag…just sayin’. Seriously, though, thanks for this, and also to all those who contributed. The thoughtless stereotypical memes REALLY piss me off. And then, the ignorant comments of self-righteous idiots, gets to me so badly that I have to turn off the computer and go play in the garden. SNAP benefits for a disabled single female parent and her 8 yr/old daughter (whom I know) = $15. per month. Should be called SAD. But I don’t understand how they can vilify an entire group of people like that after knowing (and claiming to like) people who get SNAP. I guess the one good thing about FB is that you get to see what people are really like. The median US income is 50K a year. Someone making that would pay $36 a year in taxes to support SNAP, WIC and school lunch programs. Anyone that’s upset about that amount of money is just being cruel and selfish, it’s no hardship to them to ensure that no one goes hungry. I get so angry when I see people griping about people getting assistance. I’d gladly pay many times more that average to make sure no one has an empty fridge. Thank you!! I myself would gladly pay more in taxes to insure there were no empty bellies! The topic most annoying to me is those who sell their food assistance for alcohol, cigarettes and/or drugs!! I am one for welfare drug testing!! And having to show identification to prove food card is yours! Often those with an empty refrigerator are folks who are making enough money to eat out every day – not those on welfare.